Summer’s on its way, and with it, all the sensory stimuli we associate with that most relaxing of seasons: The taste of a cold beer, the sight of kids playing in the warm, welcome sun, and, of course, the sweet sound of aging musicians passive-aggressively debating semiotics on Twitter. 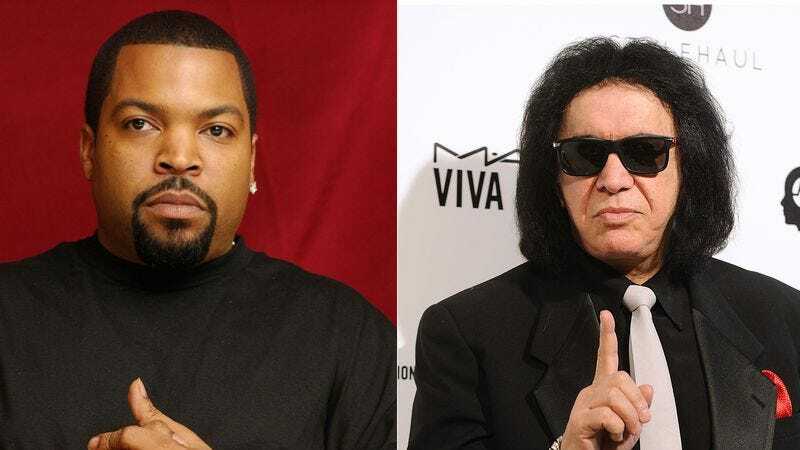 Because even thought it’s 20-goddamn-16, N.W.A.’s recent induction into the Rock And Roll Hall Of Fame has apparently kicked off yet another spin of the old “Is rap rock?” record, as played (this time, anyway) by Ice Cube and KISS frontman Gene Simmons. And while it’s not clear whether, in Simmons’ mind, America should be nothing but increasingly niche halls of fame, racing each other toward irrelevance and fighting over who gets to claim Elvis, one thing is certain: Nothing says “rock ’n’ roll” like the star of Barbershop 3 and a blood-vomiting mummy man arguing on their phones.